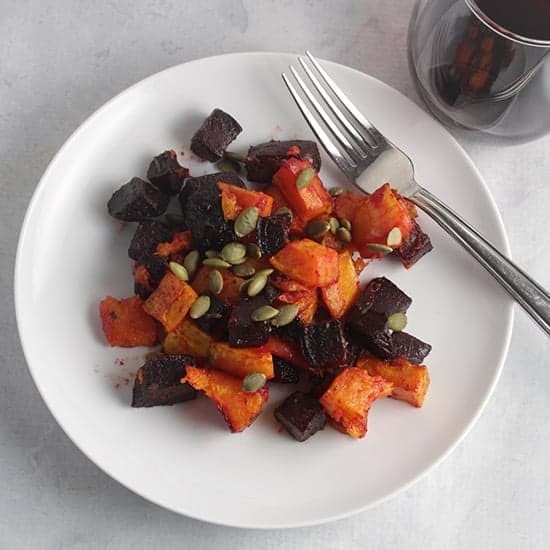 Roasted Beets and Butternut Squash recipe makes a flavorful and healthy addition to a holiday meal or a basic supper. Gluten free recipe. Recipe as given serves 4 but can easily be doubled or tripled for a holiday feast. click here to jump down to the recipe. Today the Sunday Supper blogging crew is sharing gluten free holiday recipes in honor of TR Crumbley, one of our members who lost his battle with cancer this year. TR shared lots of great gluten free recipes on his blog, so we thought this would be a fitting way to honor his memory. I never had a chance to meet TR in person. But you still definitely get to know people when you are in a blogging group like #SundaySupper. We’re always talking about family meals so we become a sort of extended family. I definitely got a feel for TR’s warm personality and lively sense of humor through his blog posts, tweets, Facebook comments, etc. I also remember the first time I co-hosted a Sunday Supper event, TR volunteered to help show the ropes. He was a big help! As I read in this Sunday Supper profile about TR and his blogging, TR focused his blogging on the gluten free lifestyle he had adopted after college. While gluten free is not something we focus on, our son does have multiple food allergies. Managing these allergies certainly gives me a great appreciation for folks that are dealing with other restrictions such as a gluten free diet. FYI, something being gluten free doesn’t mean it is safe for other food allergies! I can’t tell you how many times we’ve been offered a gluten free menu as a response to our son’s allergies to nuts and eggs. This Roasted Beets and Butternut Squash is an easy holiday side dish. There’s no wheat involved, and no processed ingredients where gluten could be lurking unexpectedly. I roasted the beets and squash at a lower temperature than I typically use for roasted veggies. I had a turkey breast on another rack, so this 325 convection setting worked for both elements of the meal to cook together. Want another great healthy recipe for butternut squash? Try our Butternut Squash and Quinoa Casserole! Beets can be a little tricky for wine pairing, but roasting the beets and getting them caramelized makes them more wine friendly. Merlot is a red wine that tends to pair well with beets. We served this dish with a good Merlot from Washington state, and it paired very well with the beets and squash. 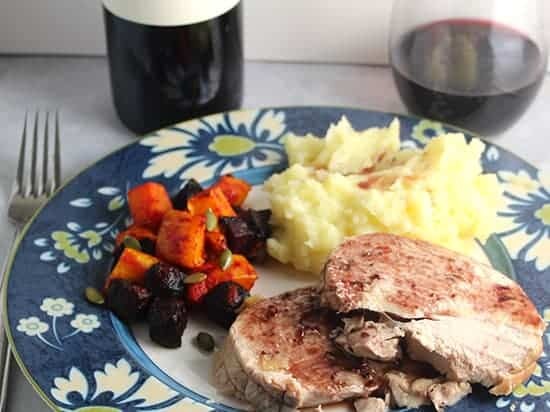 Pinot Noir, a reliable choice for a turkey dinner, also pairs well with beets and could be an option here. Roasting beets and butternut squash give the veggies great caramelized flavor, enhanced with a bit of maple syrup at the end of cooking. Gluten free recipe. Preheat oven to 325 convection setting (or 350 regular). Spread the beets and butternut squash in a roasting pan. Toss with the olive oil, garlic powder, rosemary and salt and pepper to taste. Place the roasting pan with the squash and beets in the oven. Roast for 40 minutes, and check for doneness. You will likely need about 10 more minutes of roasting but don’t want to overcook. Stir the veggies before returning to the oven. Roast another 10 minutes. The beets and squash should be starting to brown and both veggies should be tender when done. 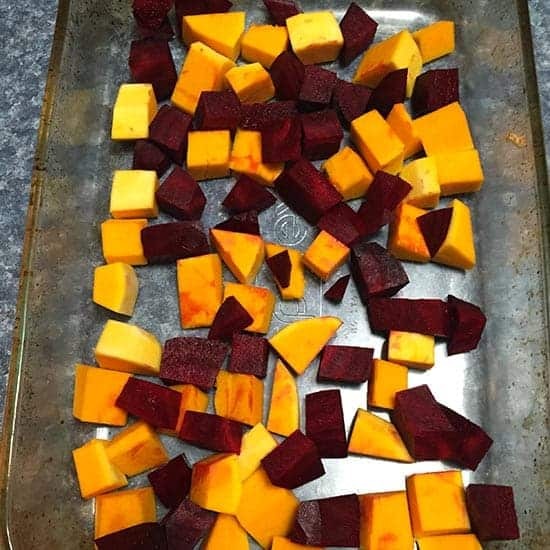 Remove the roasted beets and butternut squash from the cover when done. Toss with the maple syrup, and plate along with the rest of your feast. 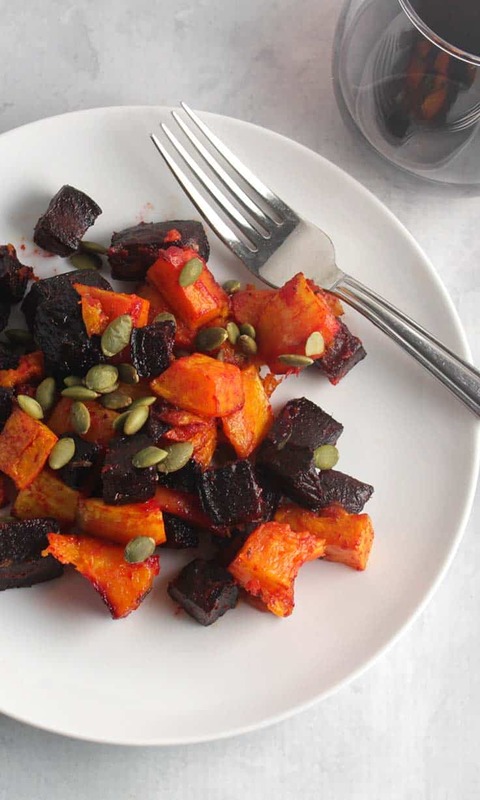 Top the beets and squash with a little sprinkle of pumpkin seeds and enjoy! I could easily eat this dish every week through the winter! What a simple, delicious combination! Roasted beets and squash take on a sweet flavor all their own! Love the combo idea! Thanks, we like the way they worked together! This is a great side dish for winter meals and so pretty!